In 2007 the International Association of Constitutional Law established an Interest Group on 'The Use of Foreign Precedents by Constitutional Judges' to conduct a survey of the use of foreign precedents by Supreme and Constitutional Courts in deciding constitutional cases. Its purpose was to determine - through empirical analysis employing both quantitative and qualitative indicators - the extent to which foreign case law is cited. The survey aimed to test the reliability of studies describing and reporting instances of transjudicial communication between Courts. The research also provides useful insights into the extent to which a progressive constitutional convergence may be taking place between common law and civil law traditions. 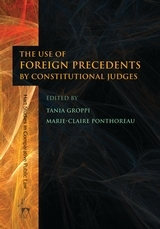 The present work includes studies by scholars from African, American, Asian, European, Latin American and Oceania countries, representing jurisdictions belonging to both common law and civil law traditions, and countries employing both centralised and decentralised systems of judicial review. The results, published here for the first time, give us the best evidence yet of the existence and limits of a transnational constitutional communication between courts. Introduction. The Methodology of the Research: How to Assess the Reality of Transjudicial Communication? Tania Groppi is Professor of Public Law at the University of Siena. Marie-Claire Ponthoreau is Professor of Constitutional Law and Comparative Law at the University of Bordeaux.